A staple of New York’s fabled music room at the Carlyle Hotel, John Pizzarelli, the world-renowned guitarist and singer, brings that Big Apple Elegance to Baur’s for one night only! Hailed by the Boston Globe for “reinvigorating the Great American Songbook and re-popularizing jazz.” The Toronto Star pegged him as “the genial genius of the guitar.” And the Seattle Times saluted him as “a rare entertainer of the old school.” Music Appreciation Society couldn’t be more excited to invite you and your sweetheart, family and friends for this special Jazz night with The John Pizzarelli Quartet. Baur’s Listening Lounge, as recommended by 5280 Magazine in its 2016 “Where To Eat” issue “…no one does dinner and a show like Baur’s”. This will be a truly memorable intimate performance to be treasured by the exclusive ticket holders for this special cosmopolitan event – get yours today. John Pizzarelli has cultivated a winning international career by singing classic standards and late-night ballads, and by playing sublime and inventive guitar. Using greats like Nat “King” Cole and Frank Sinatra and the songs of writers like Sammy Cahn and Jimmy Van Heusen as touchstones, Pizzarelli is among the prime revivalists of the great American songbook, bringing to his work the cool jazz flavor of his brilliant guitar playing. Born on April 6, 1960, in Paterson, New Jersey, Pizzarelli has been playing guitar since age six, following in the tradition of his father, guitar legend Bucky Pizzarelli. Hanging out with his father, John was exposed to all the great jazz music of the era, from Erroll Garner and Les Paul to Django Reinhardt. He began playing with his father at age 20, then went out on his own. Since 1992, the John Pizzarelli Trio has toured extensively. In 1993, they were honored to open for Frank Sinatra’s international tour and then joined in the celebration for his 80th birthday at Carnegie Hall. 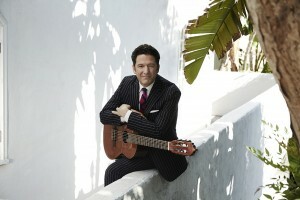 John Pizzarelli’s voice has continued to develop with time, displaying both charm and humor. He has recorded as a bandleader for RCA, Chesky, Stash and Novus, and in 1997 appeared in the Broadway musical Dream, a revue of Johnny Mercer songs. Along the way, Pizzarelli has earned rave reviews. “The John Pizzarelli Trio has never been tighter, and Pizzarelli himself has never been looser,” the Village Voice said of a recent New York show. “We can say we’re as lucky to listen to (Pizzarelli) as Nat Cole fans were in the years before he became a legend.” Pizzarelli was also named “Jazz Vocalist of the Year” by Swing Journal in their Readers Poll. John has performed on the country’s most popular national television shows such as The Tonight Show with Jay Leno, Late Night with Jimmy Fallon, Late Show with David Letterman, Conan, Live with Regis & Kelly, The Tony Danza Show and the Macy’s Thanksgiving Day Parade. You don’t want to miss John Pizzarelli Quartet, a jazz icon from New York, when he plays exclusively at Baur’s Listening Lounge in Denver. This very special night will transport you to the Big Apple for a time-honored jazz performance that we know you won’t soon forget.